Headlines around the world today all read with little variation, B. K. S. Iyengar, who brought yoga to the west, dies at age 95. And once again this summer, I find myself grappling with huge loss. 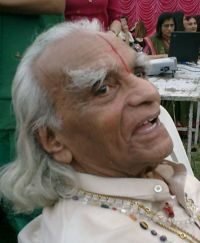 Iyengar, the guru who created a method to make yoga accessible to any body, and who created a method to train his teachers so that they, in turn, would be so rigorously trained that they would do no harm but rather heal and strengthen so those who studied the method bearing the Iyengar name. The man who resisted commercialization and marketing and selling out and kept to the purity of his vision and of his own teachers and forebearers. And the one who created the method that enabled me to use my hands and arms again when I once thought I might be permanently disabled by the ravages of repetitive stress injury. I am struck by his quote about dying majestically—how do we die majestically? What does that mean, especially in a society where medical science tries desperately to intervene—even working hard to prolong Iyengar’s life through technological interventions completely undreamt of at the time of his birth? I recall the story of his early life—how he was a sickly child and sent to train in yoga with his uncle to try to heal himself, even though he was really not expected to survive into adulthood. And how he developed his method for yoga practice through trial and error on his own body—through long hours of difficult practice observing the effects of each asana (pose) on his physical, emotional, and mental state. How he built up his strength and began to teach others, until the violinist Yehudi Menuhin came to study with him and then brought him to the west where others wanted to learn more about these teachings. “Discover what does not die”: the body may be mortal but how can we leave a lasting positive impact on this world—leaving it a better place than how we found it? “Birth and death are beyond the will of the human domain”: they are the existential givens. Our existence has finitude. Understanding that and accepting that without living in constant fear helps free the mind to live fully and potentially happily in between those two markers of time. “Live holistically at every moment”: Is your life a celebration of mind, body, and soul? Or are you only focused on your job, for instance, while sacrificing the relationships with the people who are most important to you? Is there some part of your existence to which you have been attending? What is missing in your Gestalt? “So that death is a lively celebration”: while we deeply mourn the passing of the man, we remember today all the great gifts that B. K. S. Iyengar has given the world. We celebrate his existence by continuing to practice yoga and by teaching yoga to future generations. And by sharing with others the wisdom and tenacity of great teachers like him.